Looking for classroom decor or organizers? Or maybe just some fun ideas to organize your kid's play room? These Assorted colored pails come in red, blue, green and yellow and would be perfect to use as decorations in a kid's classroom or bedroom, and even to organize! 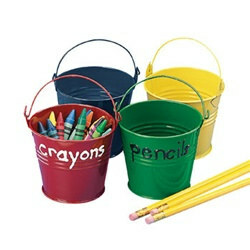 These pails are 2 3/4 inches tall and 3 1/4 inches in diameter so there small enough to sit on a teacher's desk. They would also be cute to use as party favor tins to fill with goodies at your child's next party!